Now that gap will be filled in a big way, and 103.9 GARTH-FM will be the first full service radio station to solely play one artist. 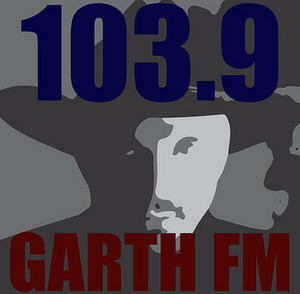 Illustrating the station’s commitment to Garth, they’ve set up garthlouisville.com and 1039garthfm.com to stream the station online. Summit Media, the parent company of GARTH-FM, owns about 24 radio stations throughout Kentucky, Alabama, South Carolina, Virginia, and Hawaii, including 3 other Louisville-based radio stations, including the area’s “NEW Country Q 103.1” Top 40 country counterpart to GARTH-FM. The launching of GARTH-FM adds an interesting wrinkle to the discussion of a potential upcoming format split for country music, with Top 40 country, and “classic” country from the last 25 years going their separate ways. Rumors that this reality might be in the offing were stimulated when Big Machine Records struck a deal with radio giant Cumulus Media to start a new NASH Icons venture. Another interesting note is that the radio station format that GARTH-FM is replacing was already playing classic country. The previous “Country Legends 103.9” established on July 23rd, 2008 touted “playing hits from Johnny Cash, Willie Nelson and Randy Travis.” This creates the question if a potential paradigm shift of country radio into two formats will potentially cannibalize under-performing classic or traditional radio stations that play music beyond this all-of-a-sudden magic 25-year “classic” country window, when big artists like Garth Brooks started their commercial ascent. There is also the possibility that as time goes on, GARTH-FM, just like many stations, could morph into this new 25-year “classic” country format and cover multiple artists. When we look back, the changeover to GARTH-FM could be a symbolic moment where the cleaving of country music into two formats began …. or a silly idea that was short lived. Sadly this station would actually be an improvement over a typical mainstream country station that plays bro country about 70% of the time. You could not have a station like this on a streaming only service. DCMA states you may only program 2 songs in an hour or 3 songs in 2 hours from the same artist. I’ve seen stations label themselves Ex Johnny Cash station on Live 365 but I’m guessing they have to be creative including their listing. I don’t think this is true. I have Spotify and I swear sometimes I get nothing but Judas Priest on both the rock and heavy metal stations. Far more than 2 songs an hour. I remember a station in Texas playing nothing but George Strait, but that was in the 90’s. I think a station in Oklahoma did the Garth thing, but that was at the height of his popularity. I don’t get this, now. And why Louisville? I personally have listened all weekend and LOVED every second. I’m praying it has something to do with his comeback! Will we be getting two-fer Tuesdays featuring double shots of Chris Gaines at the start of every hour? I couldn’t stop laughing after reading the slogan. I’ll listen to Garth Brooks music, but this is a little too much. Doesn’t diversity basically ensure a larger market share up to a point? What if I’m even a 90’s country fan but my favorite artist happens to be Clint Black or Travis Tritt? I mean… not to be too obvious but it seems like they are unnecessarily narrowing their potential audience quite a bit. It still could be some version of a stunt. I don’t believe this station’s format will be like this forever, and I don’t think they think it will be either. If I had a guess, it will eventually morph into one of these 25-year “classic” stations outlined in the NASH Icons model. My thought is that 103.9 knows something we don’t. Could Garth be planning a concert in Louisville and 103.9 is just preparing for the announcement? It’s either that or they’re stunting. Either way, it’s accomplishing what they’ve set out to do. It’s stirring up interest and working up the fan base. I live where the streaming isn’t worth a hoot. I’m going to try inbetween the stops and starts. I would rather listen to 24/7 Garth than that high pitched screaming, shouting and wailing. Good Gawd!!! I think Any station committing to only One artist 24/7 is ridiculous and to hear Garth all day and night would be torture. I never bought into his whole Act and sure don’t see him as the country savior… Especially since he’s already has his chance at it. Is he better than Bro country, ya , for sure. I can only hope his return will help to return country’s old school sound a bit & get back to the song..but I’m sure not expecting miracles since its all about sales & what sells. There is good country out there but you have to search for it a bit… And maybe that’s not such a bad thing after all. I’m guessing that the strategy might be to use Garth’s music as a starting point to define the target audience, then add songs from other artists requested by Garth’s fans. If we’re lucky we might also hear Travis Tritt, George Strait, and Alan Jackson. If we’re unlucky we might hear Shania Twain and Faith Hill, but I’m guessing that most of that audience has moved onto today’s pop country and bro country. Well now I am even MORE committed to my all John Denver station. This seals the deal. And at the beginning of every hour I’ll play a Charlie Rich track! I’m guessing Garth bought the radio station . Probably the first step to Global Garthanization . Why not ?….he’s done everything else and , personally speaking , I’d choose this station over our local bro-country station . “Two Pina Colladas” and “Long Neck Bottle” were mediocre and sounded like something that Kenny Chessney would release. Then “Good Ride Cowboy” and “Beer Run” (which was the 2nd best song with that title) were relevant because of their ties to Chris Ledieux and George Jones respectively. People will love anything that Garth puts out. He’s Elvis with a cowboy hat. And I mean no disrespect to him but anything that he puts out will be judged with the “Garth Rule”. He will not be allowed to put out a bad record. Country Music will have a savior but it will not be Garth Brooks. I’m sorry ladies, but there will be a man who will rise up with what we will recognize as a traditional country sound that the world will see as greatness and they will embrace it. At that time the “bro country” crowd will commence the same walk of shame that Hair Metal walked down many years before. It may not be tomorrow and it may not be in the next 2 years, but be ready because that man is coming. I’m not saying that Garth will save the country genre. I think the idea might be to find a commercially viable radio alternative to bro country. It has to be a large enough audience to support a mainstream station. The focus on Garth defines the target audience as people in their 30s and 40s who listen to country music with a mix of traditional and contemporary sounds, but not bro country. They might listen to artists from George Strait to Tim McGraw, e.g. 1980s to early 2000s. I don’t really find this funny at all because 103.9 was the only station around that played a classic country format. What a shame. Holy Cow…..give me a break…..I have listened to this for two days hoping something else would play…I listen to this station everyday at work …but if I have to listen to this crap constantly …I’m going to find another station…maybe 1 or 2 of his songs every hour would be enough…,but constantly… YUCK !!!!!!!! This is the oldest radio stunt in the world, they usually last around a week and then go to whatever format they plan on implementing..I’ve heard so many of these over the years in rock radio….all Zep 24/7, Stones/Beatles etc…. Wow, I like Garth all right, but this is more than a little nuts. I used to live about 45 miles from Louisville, and 103.9 was one of just a couple stations that would play classic country.. 98% of the other channels around there are nothing but bro country. Trigger,(sorry if this is off topic) I have been reading here for about 6 months, this is my first time to comment. Thanks to you and one other site I am now a huge Sturgill Simpson fan.. SCM showed me that there is so much great music still being made, and as a 17 year old fan of real country music, that just thrills me. Thank you. Born and raised in Louisville and a huge Garth Brooks fan. This could mean a few things that a announcement is imminent of Garth at YUM Center downtown or simply the company that owns the radio station is changing formats. YUCK….now I have to find another station to listen to….WAY TOO MUCH GARTH!!!!! I thought I had found the perfect station and now this. I’m very disappointed. You had a great station but now I must look elsewhere for good classic true country. Hope you switch back soon. The sad thing is that station use to be County Legends 103.9 the only station in the area REAL COUNTRY fans could listen to. Please stop with the Garth Sh@*. I like garth and all, but enough is enough. I used to enjoy listening to the country legends with my neighbor at night while we drinked. This constant garth is mind blowing and not enjoyable at all. If this continues very long, I’m sure you’ll lose many listeners. You have already lost me and my neighbor. Anybody have their local telephone number? We need to start bombarding their station with calls!!! I REALLY do NOT like this change.. I like Garth , but REALLY… i had all my stations in all my vehicles & my work radio tuned to 103.9 because i loved the varitety of the older country .. now I got nothing..
I’ve been listening for two days at work…wish they’d play some songs you never heard on the radio before…it’s the same songs in a loop it seems. it appears that I am not the only one not pleased with your change in format – as several have stated I too have enjoyed listening to the country legends – I also enjoy garth, but for gods sake, not all day long – it now seems that your station will be losing a lot of faithful listeners. I use to listed to 103.9 all the time…it was my “default” station in my car and on my office radio. I like Garth, but as far as I’m concerned the new format is a huge step backward. The old 103.9(Classic Country) with a little bit more Garth thrown in would be great. Nothing but Garth is awful. I think they’re trying to distract us from these gas prices around town. It sure is hard to be humble when your perfect in every way. I so miss my Don by god Williams, Merle big daddy Haggard,and uncle Willie Nelson. So where can I go get my Conway Twitty now? Sorry i haven’t been a Garth fan since he sh## all over Sandy. Thanks, now there are NO STATIONS in the Louisville area to listen to classic country. I am a fan of Garth Brooks, but not JUST Garth Brooks. The article mentioned losing the 90’s… Maybe there was a reason for that??? The classic country format was WAY better. Sure Garth was the biggest selling country artist in that time, but that doesn’t warrant casting the other legends (a lot that inspired Garth) like George Jones, Johnny Cash, Waylon Jennings, Hank Williams, Hank Jr., Don Williams, etc. to the side. That’s like dedicating all televised golf coverage to only Tiger Woods because he was so big in the early 2000’s. Never mind that Arnold Palmer, Jack Nicholas, Payne Stewart, and others helped to bring golf to a whole new level…all BEFORE Tiger. You’ve darn sure lost me as a listener, WRKA. Are you kidding?? This is a really bad joke. Yeah, everyone likes garth. But I don’t care, no one likes ANY artist enuf, to listen to it 24/7. Louisville radio stations are pathetic. You go to any other city, and you don’t get crap like this. The Country Legends were great. And I know for a fact, had a lot of dedicated listeners. Ratings are doomed, you stupid idiots. Who is in charge here?? Omg. Get freakin real!!!!!!!!!!!!!!!!!!! So you, whoever done this, are telling all listeners, that Garth ALONE…is better than G. Jones, Hank, Waylon, Willie???? Someone needs to restaff the management here. Lets take a vote shall we??? Hank, Johnny, Willie, Waylon, Merle, Don, George, George, Kris, Loretta, Dolly, Patsy and……………………………all the rest, BRING THEM BACK ALREADY!!!!!!!!!!!!!! !